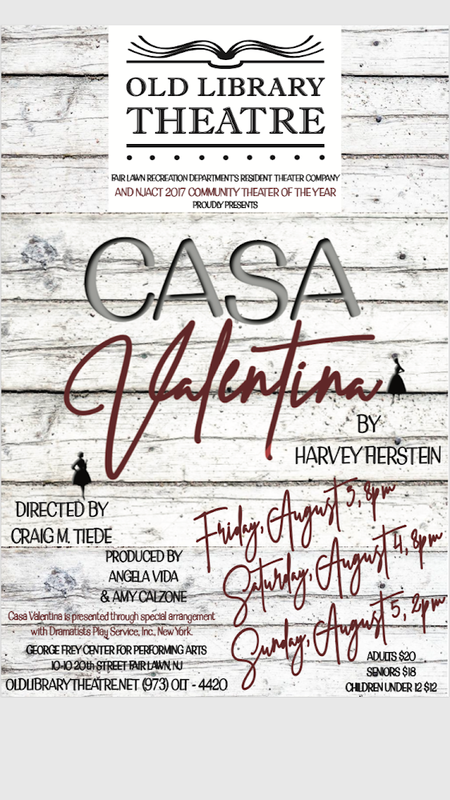 Old Library Theatre, Fair Lawn Recreation Department's resident theater company and NJACT's 2017 Community Theater of the Year, is proud to present Casa Valentina. Written by Tony-winning actor and playwright Harvey Fierstein, Casa Valentina places us in the Catskills, in June 1962, where an inconspicuous bungalow colony catered to a very special clientele: heterosexual men who delighted in dressing and acting as women. These white-collar professionals would discreetly escape their families to spend their weekends safely inhabiting their chosen female alter-egos. But given the opportunity to share their secret lives with the world, the members of this sorority have to decide whether the freedom gained by openness is worth the risk of personal ruin. Directed by Craig Tiede. Produced by Angela Vida and Amy Calzone. Presented through special arrangement with Dramatists Play Service, Inc. Starring Michael Smith-Gallo, Laura Valente, Eric Najimian, Josh Cohen, J. Edmund Fond, Brendan Joel Bartlett, John L'Ecuyer, Larry Sanders, and Angela Grippo. Three performances only: Friday, August 3 and Saturday, August 4 at 8:00pm, and Sunday, August 5 at 2:00pm.